School Feeding in Mozambique Underway - Planet Aid, Inc. The excitement in Mozambique is palpable as the Planet Aid and USDA school-feeding project gets underway. This week the corn-soy blend arrived in the port city of Maputo. The food commodity will be used to provide 34.2 million daily school meals to 60,000 school children. The commodity is the cornerstone of the three-year $20 million dollar program that will also involve training primary school teachers and address other critical community needs. Read more about the USDA-Planet Aid project here. 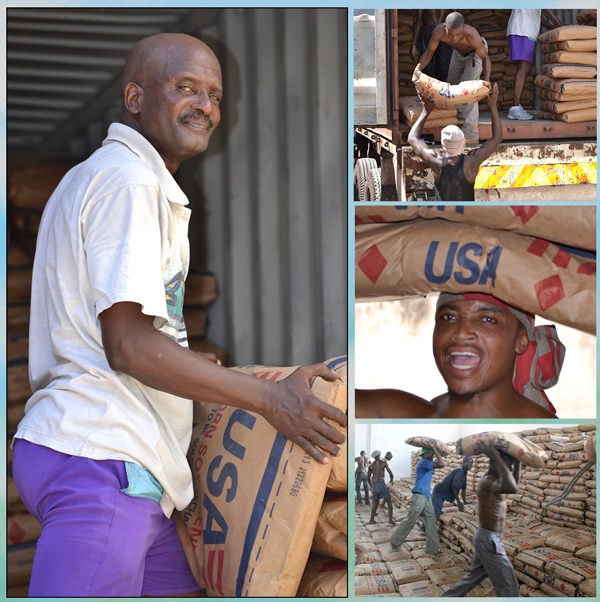 Photo montage: Sacks of corn-soy blend are unloaded from the docks in Maputo, Mozambique and stacked in a local warehouse (photos courtesy of ADPP Mozambique).